A versatile adaptor that is specifically designed to be custom patched. An RJ45 socket is mounted in the hood of the adaptor. 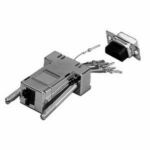 Each pin of this RJ45 connector has a short wire which terminates in a gold contact. The gold contact is pushed into place (hand pressure only is required) in the desired pin location in the DB9 shell. As the DB9 is female, this adaptor is typically used to connect custom-built equipment to the DB9 male serial port of a PC, though naturally there are many other applications. Looking inside the adapter hood, it can be clearly seen which short wire connects to which pin in the back of the RJ45 socket. No reliance should be placed on the jacket colours of these short wires. (Their jacket colours cannot match RJ45 wiring colour standards as these standards (Ethernet T568A, Ethernet T568B, Ethernet crossover, ISDN etc.) are all different. NB: Pin extraction tools are not available.